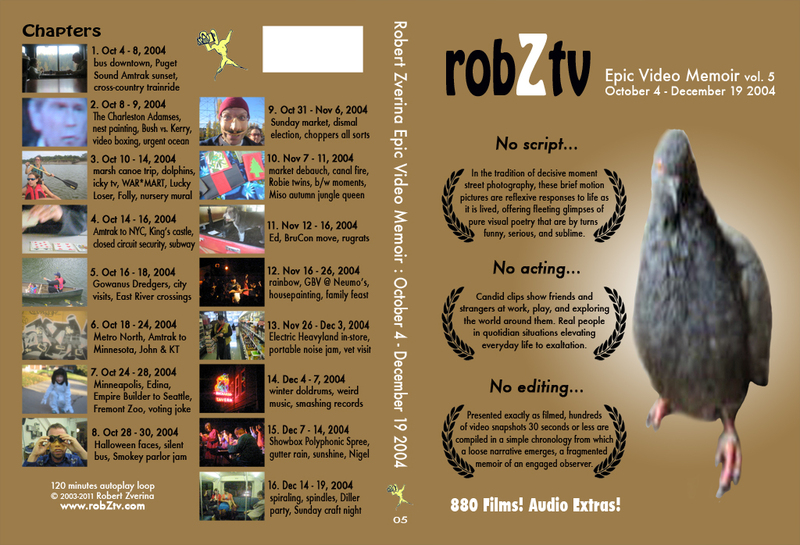 robZtv is an epic video memoir available as feature-length DVDs--collect 'em all! Sorry if some DVDs are unavailable; since acquiring CreateSpace, amazon has made it harder for me to distribute my work. 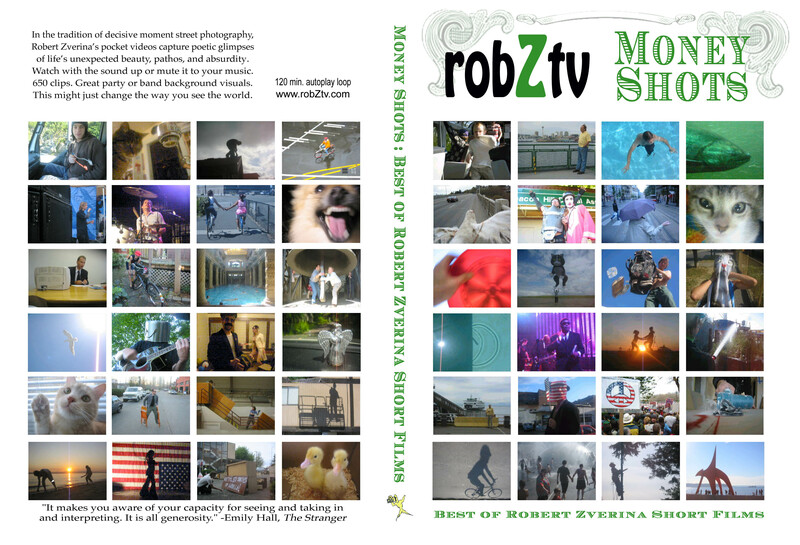 We interrupt this series to bring you a special edition: robZtv Money Shots. Call it a "best of" if you'd like. 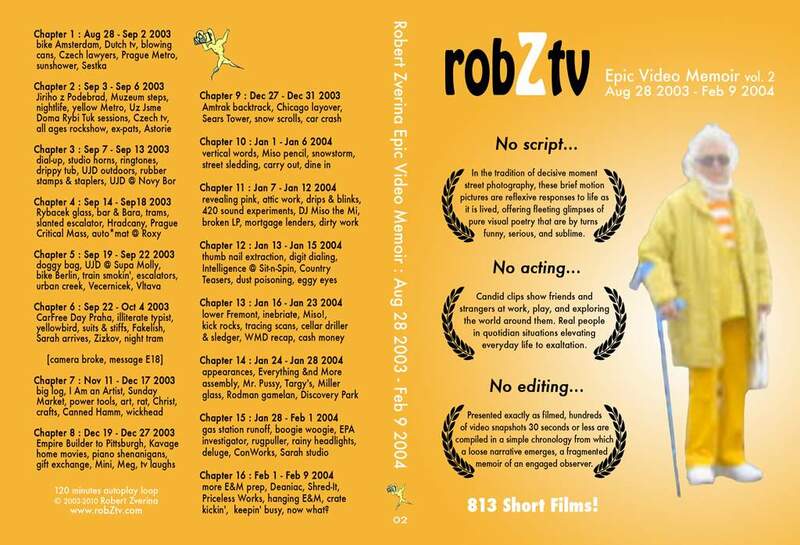 If you're going to have only one robZtv DVD, this is the one to have. 650 video clips in two hours. All yum! Like the box says: In the tradition of decisive moment street photography, Robert Zverina's pocket videos capture poetic glimpses of life's unexpected beauty, pathos, and absurdity. Watch with the sound up or mute it to your music. Great party or bar/venue background visuals. This might just change the way you see the world. Summary: This volume begins on first day with the RE Store salvage crew, the most meaningful and satisfying job I've held. Lots of interesting views of field work balanced with footage from Priceless Works Gallery's heyday plus assorted extracurricular weirdness, noise music experiments, and local travels. Highlights: RE Store architectural salvage field crew, Melvins @ Electric Heavyland, Oregon coast, Pyramids @ Neumo's, Bush inauguration protest, Priceless Works Gallery, Dead Girls artshow, Seattle cycling scenes, and much more. Bonus: Watch with original source audio or select music soundtrack improvised by Seattle's own 4Shadows. Summary: A rather dense two hours, much train travel--Charleston, NYC, Minnesota--and a lot of latenight experimentation. Less work, more play, at a loss over stolen election. Summary: A summer spent living and working at a seaside resort on Orcas Island to heal a broken heart and hold out hope for tomorrow. Lots of time spent counting pebbles on a beach and sitting with an empty mind. Bucolic! Summary: A weird winter in Seattle, excavating a dusty basement for pay and making immersive art installations for love. Spring trip to Prague--cathedrals and campfires, business start-up and buying house. Summary: Dreamy trip to Europe replete with bikes and bands, then harsh return to blue collar workaday slog in Seattle remodeling a millionaire's attic and basement with side Xmas train trip to midwest. Summary: Working a meager job as landscaper while US ramps up for invasion. Futile protests and initiation into construction work as unskilled laborer. Trips to Pacific coast, SoCal, Vancouver, and Orcas Island. 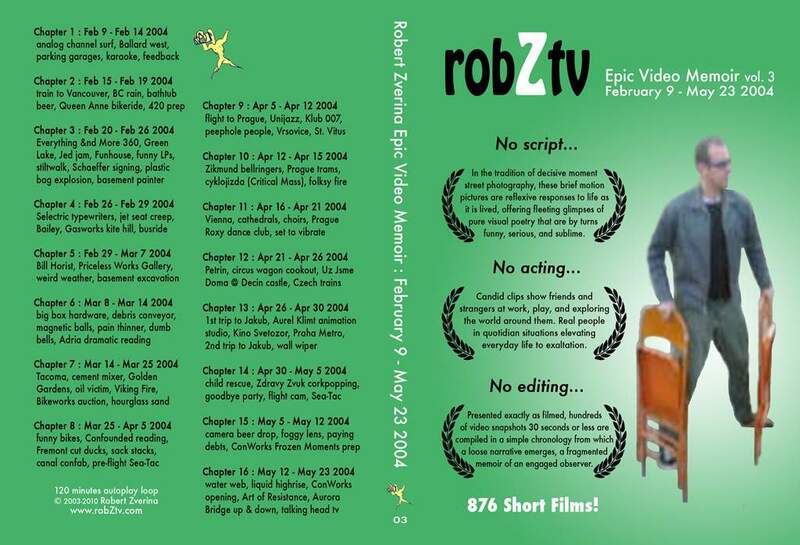 Since February 2003, Robert Zverina has filmed tens of thousands of unscripted digital video shorts using only an ever-present pocket camera. 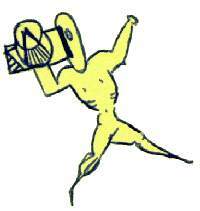 Of these, the best have been selected and compiled into a still-in-progress magnum opus which reveals a visually exact, deeply involved, and slightly eccentric view of the world. 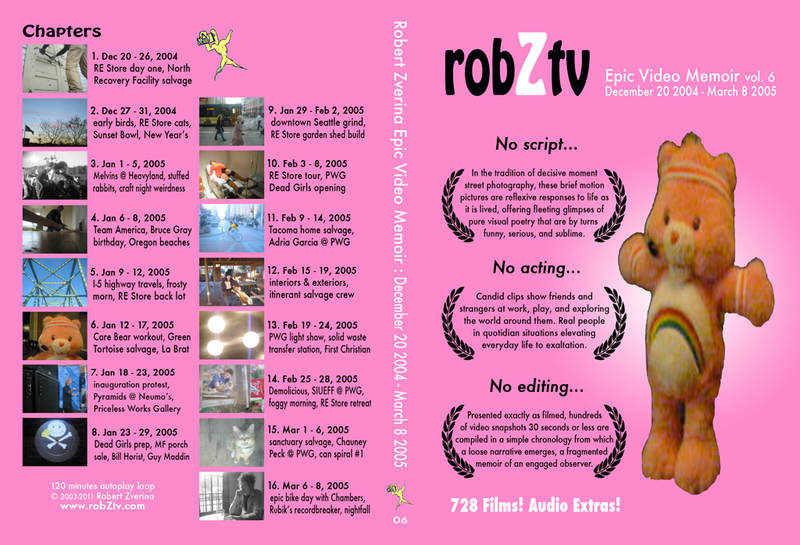 Inspired by a childlike sense of wonder as well as bemused curiosity about human behavior, robZtv is an unprecedented film series sure to be valued for its aesthetic and documentary qualities. Unpretentious and curiously addictive, this unique cinematic experience might just change the way you see the world.